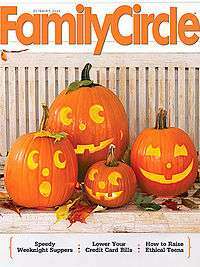 Family Circle is an American home magazine published 15 times a year by Meredith Corporation. It began publication in 1932 as a magazine distributed at supermarkets such as Piggly Wiggly and Safeway. Cowles Magazines and Broadcasting bought the magazine in 1962. The New York Times Company bought the magazine for its woman's magazine division in 1971. The division was sold to Gruner + Jahr in 1994. When Gruner + Jahr decided to exit the US magazine market in 2005, the magazine was sold to the Meredith Corporation. ↑ Dave Eisenstadter (May 28, 2015). "Family Fun magazine leaving Northampton; jobs moving to New York City". GazetteNet. Retrieved December 12, 2015.